Good Friday seems perpetually under siege. First from shopping, then footy in New South Wales, and now in Victoria from gambling. This progressive encroachment suggests two questions: What protection, if any, should Governments and business give Good Friday? How will the public marginalisation of Good Friday lead Christians to see and celebrate the day? Changes in the public celebration of Good Friday have been significant. Sixty years ago shops did not open, few people worked, trains and buses hardly ran, there was no public entertainment. It was a long, quiet, heavy day. It reflected the historically large attendance at Christian churches and the place of Christian faith in the public space. Now Good Friday is still largely a day free of work. But in a mobile Australia where Christian allegiance and practice are no longer taken for granted, it is a day for shopping, still restricted, and diversion. 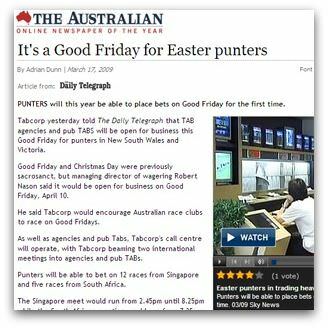 But when businesses like football, gaming and supermarkets test the waters of public response as they seek to exploit Good Friday, they now find their toes nibbled rather than bitten off. The arguments for maintaining the exclusions associated with Good Friday are generally based on one of two considerations: respect for Christians to whom the day is sacred, and the benefits to society of maintaining a day free from pressure to work and to spend. Neither argument is conclusive. The decline in meaningful Christian allegiance, and the growing number of Buddhist, Hindu and Muslim Australians may lead us to ask why a Christian holy day should be especially protected. Even conceding the public benefit of days free from pressure, too, we may ask why Good Friday should continue to be such a day. Perhaps it is helpful to ask the more radical question: why should there be any stable public holidays at all? Public holidays constantly forget or embroider their origins. They recall events which were significant to different groups in Australian society, even after the significance is no longer shared. For many Australians the anniversary of the arrival of the first English settlers in Australia is no longer an occasion for joy, but it remains important to remember for its influence on Australia. Similarly, few remember the stonemasons' strike that in Victoria gives the date to Labour Day, but it rightly enshrines the importance of workers' struggle. Anzac Day, too, has changed its character but like the other public holidays, its celebration prevents forgetfulness. Holidays recall the experience of particular groups of Australians, but can be celebrated by all as shaping the nation. From this perspective the preservation of Good Friday marks the importance of Christian faith in Australian settlement and culture. This faith and its varying practices formed one of the factors that helped shape Australian institutions for better or worse. To lose it as a holiday would be to forget something significant. As a public celebration, however, Good Friday can be expected to change as Australian culture and habits evolve. All holidays do. We should ask, then, whether the non-commercial aspects of the holiday are important in preserving its character and its relationship to the religious traditions that it recalls. This kind of argument has been made with some success for the celebration of Anzac Day. It could also be made for Good Friday. But it would need to take into account the way in which Australians generally wish to celebrate holidays. The changing face of Good Friday will surely change the way Christians see and celebrate it. Even if it is a holiday, it will no longer be a de facto public religious feast. That could be helpful for Christians if it returns them to the nature of the event they recall. Jesus was put to death on a weekday. The soldiers who did the job gambled their time away. He was killed shortly after he challenged the commercialisation of the Temple and the corporatisation of religious faith. His trial and executions were the day's public entertainment. Being exposed to Australian public values is quite a good context for entering the events that Good Friday remembers. Don't forget the Easter Show in Sydney. It was a surprise to find out that GF is not a holiday in USA, Ireland or(I think) Italy. In Melbourne, Good Friday is synonymous with the Royal Children’s Hospital Appeal which has always had a special place in the media. From a Christian perspective the plight of suffering innocent children is a pertinent focus for celebrating the extraordinary courage of Jesus who suffered and died in a dire effort to draw attention to what is eternal Truth and Reality. Many years ago, someone working for me asked for leave to observe his Jewish religeous obligations. I was impressed by his commitment, and this started me thinking about this issue. Br Thornber's post puts this in perspective. How many Christians would be like my colleague Geoff, and give up a day's leave to observe their religeous traditions? The numbers attending Good Friday services are low even though it is a public holiday, and sadly on this basis the religeous case for it remaining a public holiday is weak. Easter Sunday and Christmas Day are better attended and therefore have a stronger case. A final word about Geoff. He was upfront about why he wanted leave. He could have hidden behind 'personal reasons' but instead affirmed his faith. After many years, that affirmation still resonates in me. I would suggest that the day be available to committed Christians who are formally affiliated to a Christian church. They would value the afternoon off to go to church as that is when it is perceived that the Cruicifixion took place. Rather, we could have a holiday in September and call it Family day or Children's day. We have so many Christian holidays that have had the origins or reasons overshadowed but other forms of entertainment and as the article says, shopping, sport and now possibly gambling. I am a Christian and it breaks my heart to see the behaviour of some people on this sacred day. Give it back to whom it belongs. From a secular point of view I think the very long weekend 'Easter' provides is perhaps important as people can take a good break - often as a family at the beginning of school holidays, with the end of the summer weather. When I grew up in a fairly religious family, there was only church on The Lord's Day so no Christmas Day or Good Friday services. We usually went away for the weekend - in those days my father had one week's annual leave a year. When commercial interests test the water to see if they can exploit the vacuum of Good Friday Andrew writes that "they now find their toes nibbled at rather than bitten off". As a practising Catholic I am embarrassed by the opinions expressed by those nibblers, spokesmen for the catholic church and other Christian demominations. Why can't they see that it is primarily a socio-economic issue? No one is saying Christians can't go to church on Good Friday. Nor are they saying they are obliged to go to the TAB or the footie or to the pre-Easter sales. Live and let live, I say. There are more important questions for Christian leaders to raise at Easter than what should happen commercially on Good Friday. Like, what are we doing to make it more worthwhile/attractive for our parishioners to come to church on Easter Sunday? Worth pondering two matters not included in the article: the greatest gamble of all...the life of Jesus for humanity...and the second gamble on that first Good Friday...the lottery for the clothing of Jesus. Who'll be bold enough to suggest crucifixes in TAB agencies? In England 50 years ago Good Friday was not a holiday. I remember back in the late 40's working half a day. We have become to used to 40 hour weeks or less. There have always been people working shift work when public holdiays did not count. Many countries around the world have holidays or holy days for the important days of the particular major or national religion in their country. Australia has its Christian heritage and therefore we need to continue to repect our heritage. Andrew is quite right to pose the question and relate the issure to the other public holidays. Some of the comments from readers regarding the source of the day are very enlightening. It is very sad that we now have almost 24/7 trading 363 days a year. Yes I remember the quit times of the 50s and 60s ... It really did let us rest from our labours. For Christians to attempt to impose our sacred days on others is perhaps contrary to the spirit of the Gospel. Why can't we simply add the present public holidays to the annual leave entitlement. We could add the proviso that access to that leave entitlement be guaranteed, for anybody requesting it, on those days which are now gazetted public holidays, or on days recognised as important to some people as religious or other festivals. This would ensure that everyone is able to celebrate days important to them in their own way. Keep Good Friday, I say, we need to have a rest from the hubbub of daily life and just be peaceful because it is a peaceful and holy day. The shops should close, so, those that work there can also have a rest. I think that all religions should be allowed to celebrate their holiest of days whatever religion it may be. Yes, John Thorner, you are right: in Italy, Good Friday is a normal working day. The schools are closed and many people have already gone on holiday, but all the shops are open and business proceeds as usual. US Republicans lobbied President Obama to impose hardships on Salvadorians livingin the US should the Farabundo Martí National Liberation Front win last week's election. When the left did triumph, he did the opposite and congratulated the new leader. The Victorian bushfires forced people to think about the costs and values associated with living in the bush. The financial meltdown will in turn make us consider our care for the needy, and how, and indeed whether, we must pay for it.